This is a updated design from Party Animals. Kids adore inflated water slides. This unit is great for small kids or teenagers. 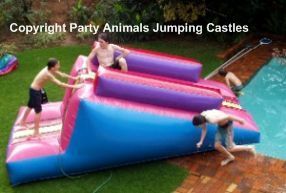 The teenagers like to bounce on the step and do flips over onto the slide, while young kids climb up the cargo net and then slide into the pool at the bottom. On a hot day they will stay sliding on them for hours! The Pool Wedge works great directly into a swimming pool if space permits. Dimensions: 4m in length, 2m in width and 1.5m in height. The Pool wedge uses a .75kw motor with a 15m extension lead. If your power point is further than 15m from where the slide will be placed, you will need to provide an additional extension lead. These are not provided by Party Animals.